History is not just in books-it can be found along the very road that takes you to work or school. When you are driving on New Mexico's roads, you may see archaeologists along the roadside, recording and preserving our state history. What we have learned from this archaeology extends back thousands of years, and has helped us understand how people lived in this harsh climate 5,000 years ago or 100 years ago. The Highway Archaeology Program of the New Mexico Department of Transportation is now celebrating its own history, as the first program of its kind in the United States, with 50 years of important research and protection of the past. "Thank you" to all of the archaeologists who have contributed their time and efforts to the Highway Archaeology Program. Everyone involved with this program has left a story of the past that is the most precious gift to all New Mexicans - a story of who we are and how we lived. Funding for Roads to the Past was provided by the New Mexico Department of Transportation. The exhibition is traveling under the auspices of TREX: The Traveling Exhibitions Program of the Museum of New Mexico with support from MetLife Foundation and McCune Charitable Foundation. The exhibit's content was developed through the Museum of Indian Arts and Culture, the Office of Archaeological Studies, the New Mexico Department of Transportation, and TREX, in consultation with the Indian Advisory Panel of the Museum of Indian Arts and Culture. Artifact Photography by Blair Clark of the Museum of New Mexico and Carol Price of the Office of Archaeological Studies. An archaeologist works in a pueblo roomblock, dating to ca. AD 1300, exposed by highway construction. 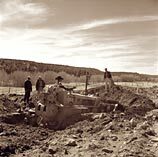 Archaeologists monitoring the bulldozer phase of excavation at the Apache Creek Pueblo.